The scaffolding was removed yesterday. 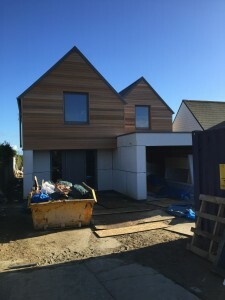 From the first picture it looks like you don’t have any flashing or a big enough drip to take water running from the cedar away from your render? Have you experienced any staining yet? Hi Sam, we designed a 45mm drip mould detail that forms part of the bottom cladding strip. 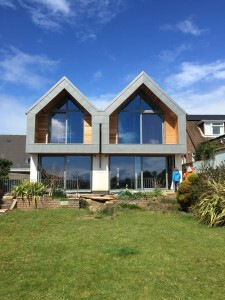 The cladding providers machined it for us as part of the cladding package. It seems to work well. We also let the cedar weather for 3 months before we applied the final coat of render, and there was staining every time it rained in those months. Glad we waited to apply render.